I have quite a few friends who have put their passions to use by blogging about them. To name a few: music, movies, cooking, healing, fashion. They provide useful information, tips and techniques, media downloads, online classes, forum boards, etc. They do not sell anything. And even though most of them have no special knowledge of SEO and SEM, their sites (blogs) are popular and well ranked on the search engines. Most of these sites are are also completely ad free, the reason usually being that it never even occurred to the website owner to monetize the site. I find that amusing considering the growing number of internet opportunists who do it the other way round: set up a quick drag-and-drop website, fill it up with free content readily available on the internet, and load it with ads hoping they will make them some money. Well, here are good news for all you authentically passionate bloggers: it's payback time. If you have been blogging for some time and have managed to attract a steady stream of visitors to your blog or website, you might as well start to cash in on it. This is a list of great ways to monetize your site and get some passive income. Founded in 2003, Chitika is an award winning on-line advertising network serving over 2 billion monthly impressions across more than 80,000 websites. It is a tested channel for targeting on-line consumers and qualified buyers, and is an easy-to-use platform for earning daily ad revenue. Chitika has been greatly improved over the past year, and upgraded to Chitika | Premium ads which are designed to give publishers more revenue. Using innovative click prediction technology, Chitika determines when to show (and when not to show) an ad. Similar to Google Adsense, it is targeted to each user, so what you see on the page might be different than what your readers are seeing. However, since they are targeted to the user — they command higher CPMs than untargeted ads. The high-quality graphic/banner ads come in many formats and are highly and easily customizable. In the opt-out section, you can keep Chitika | Select switched on, but opt-out of the image ads part of the service. Finally, it's worth mentioning that Chitika has had great reviews among publishers, and many say that it does not conflict with or decrease their Adsense revenue. Paid reviews are where an advertiser pays the blogger for a review of their product or service. Bloggers should let the audience know when a post is paid for; in some countries it’s required by law (including the U.S.). You can use Izea’s PayPerPost or make your own arrangements. The advantages are that you get paid to review products and services in your niche. It’s easy and requires little effort. However, not every niche and blog has the opportunity to review a product. This method is a short-term monetization strategy. Infolinks is an advertising platform that places in-text ads within your website content and pays you each time when they are clicked. Their software identifies the most valuable keywords within your website content and double-underlines theses keywords, and when your visitor hovers his or her mouse over them an advertisement related to the keyword is displayed. If they decide to click on the “learn more” you are compensated. With Matomy SEO you can have contextually-relevant links based on your website's content. They have tens of thousands of active advertisers looking for relevant placements to drive targeted traffic to their websites. Once your site is approved, it will be added to our marketplace within 48 hours, at which time your advertising space will be ready for purchase. All it takes is one simple installation to start monetizing your site and earning a lifetime of revenue. Advertisements are priced on a flat rate for a 30-day period, so your earnings will not be dependent on clicks or impressions. Etsy is a marketplace where people around the world connect to buy and sell handmade and vintage goods. It offers a unique array of products that appeal to a wide range of audiences. If you have a large presence on social media, especially Instagram or Pinterest, you can promote affiliate products using Etsy. This is a great option for visual merchandise, i.e., fashion or design or food blogging. The idea behind CPALead is to protect your website content through a gateway. Only when visitors complete a survey or an offer they get access to the content. It works best when you have premium content to offer to your visitors, such as video streaming or media downloads. In such cases it is possible to initiate a file download after completing a survey/offer. That's helpful if you don't want your visitors to grab the download links from the source code. Considering that people like surveys and expressing their opinion, it's easy to see why CPALead works so well. CPALead is one of the fastest growing CPA networks worldwide because it keeps in step with technology and trends. Compared to its competitors, it offers other innovative features. You can also let people complete trial offers, pay via PayPal or send a paid SMS to unlock your content. Also available are plugins, widgets and tools to help you keep track of your stats. The dashboard gives you an overview of all the important statistics and functions. Last but not least, CPALead has excellent customer support. If you are not satisfied with your daily earnings, you can simply submit your feedback and they will work on it. They will also share more revenue when you start sending more leads their way, and will increase your payout two times a month (instead of just one time). Linkbucks is a social advertising network with an original concept in website monetization. It was built with bloggers in mind, to help them monetize their posts and links. Instead of providing you with links from other advertisers, Linkbucks lets you convert your own links into paying ones. This means that you are getting paid to link to those sites you would have linked to anyway. Intermission ads show up before the page you linked. Since these ads bring more views, you get paid more per view. These ads will forward the viewer to the target link after 15 seconds or the instant they click on the “continue” button. Top Banner ads are displayed in a small top frame above the site you are linking to. They are completely unobtrusive and stay in a top frame above the target site until the viewer closes the frame. Pop Up ads will appear as a little pop up window on the page you linked. The advantage of this method is that your links go directly to their destination with any intermission or framing. The control panel is easy to use and gives you total control of your advertising: what sites to link, which ad format and placement. They offer custom programs for forums and blogs. If you have popular content, you can make good money. The sites that do best are the ones with offering videos and other media downloads. You get paid twice per month. Bidvertiser works on a PPC advertising model. You get paid for every visitor that clicks on an ad. Bidvertiser's advantage compared to other PPC providers, is that they are maximizing your profits by letting advertisers bid on your ad space. They will always display the highest bidders on your site, assuring the maximum revenue possible at any given time. You will see a constant improvement in your bidding over time, as both your visitors and advertisers will be exposed to the opportunity of bidding against each other on your ad space. BidVertiser supports 5 groups of ads: Banners, Buttons, Inline Ads, Skyscrapers and Free Design. All ads are fully customizable to fit the site's look & feel. With a simple point-and-click tool you can customize the layout of the ads to fit your site's look and feel. You are also able to filter-out any unwanted ads. Prior to your own filtering, each ad has to be pre-approved by the editorial team to ensure proper spelling and grammar. By using the Publisher Center you can generate detailed online reports to monitor your ads performance, including the number of page impressions, clicks, click-through rate, and the total amount you've earned. Bidvertiser pays monthly, either by check, or instantly through PayPal with a minimum of only $10. 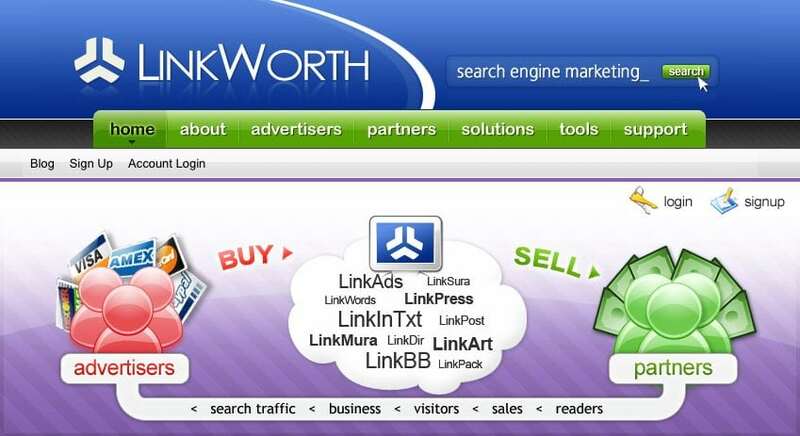 Among the partner products in LinkWorth arsenal, you will also find useful tools like Press Release Service and Directory Submission. The site is generally easy to use and the reports are clear. After you register an account, you must still sign up for sponsored post or text link ad opportunities in order to be able to receive them. They offer two options on how much of the commission you want to share: 50/50 or a 70/30 split. The advantage with the 50/50 split is that you get a lot more opportunities. Obviously, Linkworth gives these accounts priority. Try the 70/30 and if you havent received opportunities for a couple weeks, I recommend switching to 50/50 split. Linkworth pays out by check, PayPal, or direct deposit. OIO Publisher is a software that allows you to place ad spots throughout your website and manage the sales of those ads yourself. The goal of OIO Publisher is to save you time, keep you in control of your ad space, and let you keep 100% of your website's revenue. If you are promoting your ads yourself, you always need to negotiate with the advertisers, send payment details, get link info, etc. With oiopublisher, all you need to do is add your advertise page link in the post or email. You don’t even have to be online when advertisers buy ad slots. This saves time and helps to fill more ad slots in a shorter time. The advantages of using OIO Publisher is that you can place ad slots of all kinds on your blog. Text links, Banners of all sizes, inline ads (video ads, banner ads, and in the rss feed), paid posts article provided by advertiser, and paid reviews so you can write about the advertisers product, service, or site. Also available are plugins that make work much easier. OIO Publisher can be used to sell your own digital products. As long as you can place it in a zip file, you can sell it via OIO Publisher. You can even have your own affiliate program. Regardless of what you are selling: ad slots, paid posts, your own product, you can easily set up an affiliate program that will enable to track and pay your affiliates. You can take payments through PayPal, 2Checkout, Google Checkout, Authorize.net, EntreCard and offline payments. Thank you for posting this. I wasn’t aware there were so many different mediums of online advertising. Your article was enlightening. Thanks for the info. I have been using Altitude Digital Partners for the best CPMs. They work with the ad networks and monetize 100% of my inventory.They have great customer service, are easily available, and pay on time. It leaves me time to focus on my content! wow, great post, i am first time reading about these things, and now i m wishing to apply all the above mentioned on my site… thanks for sharing. Attractive selection of content. I just stumbled upon your blog and actually enjoyed reading it. Just subscribed to your feeds to keep up with the new lists. Hello there, I found your blog via Google while looking for related topic, your web site came up, it looks great. I’ve bookmarked it in my google bookmarks. Linkbucks is good. Use it for simple marketing and improve productivity when working with teams.